Drag racing has always been a uniquely American sport. It spawned from weekend cruisers getting a little too frisky with their cars on public roads. Then, along came the Drag Strip where people from all over would congregate to find out who had the fastest car in town. These contests of acceleration and speed developed with the inception of the NHRA, which established rules developed over many years to help racers compete more fairly. Despite all the rules of the NHRA, every once in a while somebody would come up with a new idea that does not break the rules, but causes he or she to have a significant advantage over other racers. The changes might be small, but become readily apparent in the new times and records he or she sets. Over the years, drag racing has endured the induction of Nitrous Oxide, the supercharger (single and multispeed), the turbocharger, and last and certainly most dangerous, Nitromethane. New rules are created to help racers compete, and the sport moves forward, sometimes in great leaps. Enter Brent Leivestad, of PFI in Fort Collins, Colorado. The picture you see above is Brent’s take on how pro front wheel drive drag cars should get the power to the ground. In his setup, the output shaft of the engine points to the front of the car, which puts power into a GM Powerglide transmission. The output of the normally rear wheel drive transmission goes into a v-drive assembly, normally used in speed boats, which then drives the front wheels via a ford 9in rear end. Some may ask how he is going to steer it, and to be serious, I have no idea. Did I mention this setup uses 12 fuel injectors? 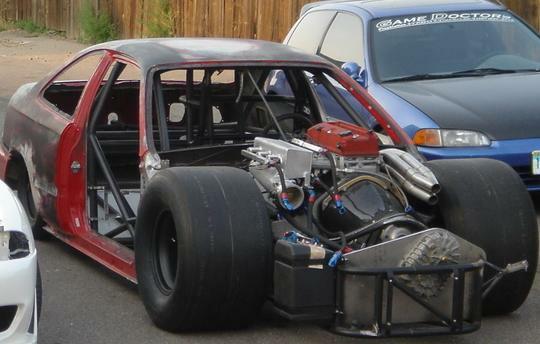 Brent intends to make in the neighborhood of 1500hp with this setup, and possibly a few new pro front wheel drive records as well. If you would like to read up or see more pictures of the madness, check out the 20 page thread on the topic on Honda-Tech.com. Brent, on behalf of the entire Import Drag Racing Scene, thanks for the hard work making this crazy idea come to life.